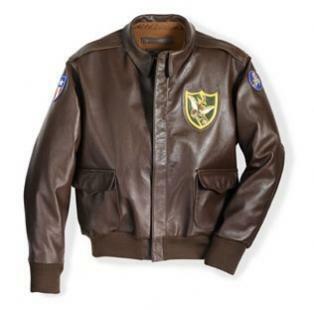 An authentic replica with history, this A-2 jacket is made from 100% American horsehide leather. Details include an authentic China Burma India leather appliquÃƒÂ© blood chit on the jacket back, antique silver thread bullion China Burma India patch on left arm, The Flying Tigers 13th Air Force bullion insignia on the right shoulder, a leather appliquÃƒÂ© Flying Tiger 23rd Fighter group insignia on the left front chest and an officer I.D. card in the lining. This jacket is also made to vintage military size specifications. It fits snugly so we do recommend that you order one size larger than your normal size for a more comfortable fit. For the purist, take your regular number chest size. Proudly made in the U.S.A.